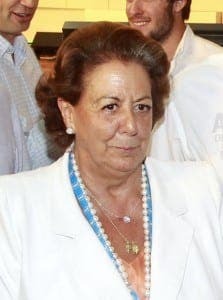 DEATH threat letters were delivered to Valencia politician Rita Barbera just hours before she died. According to El Mundo newspaper, it prompted the 68-year-old to alert a friend in the office of the interior ministry in what would be her last ever text message. The events were uncovered in the paper´s investigation into the last 37 hours of the controversial ex-Valencia mayor and Partido Popular senator, who died of a heart attack on November 23 at the hotel Villa Real in Madrid. She had been staying there while giving evidence at the city´s Supreme Court over her alleged involvement in a money laundering operation out of Valencia´s city hall. According to a friend of Barbera´s, the threats were the latest in a string of letters sent in less than two years to her. They told El Mundo that she had also been sent two bullets through the post. Barbera was suspended from PP earlier in the year over the corruption scandal. Last week friends and family members tried to pin the blame for her death on the stress caused by her suspension and a media witch hunt.